Have a Blast at Guns Elliston, it's an Experience!! The Town of Elliston is a quiet tourist destination known for Puffins and Root Cellars. However, it is also the smallest community, in Newfoundland, to have its own Federally approved shooting range and we offer a special opportunity to the adventurous. Ever see a gun in a movie, tv show or video game and wonder what it might be like to fire one? Here is your opportunity to find out and take home a souvenir target you shot! So, if you are exploring the Bonavista Peninsula, especially the Elliston/Bonavista area, and looking for a unique and exciting experience book a package today. What can you do at Guns Elliston? We provide shooting instruction and will guide you through each step ensuring you have some safe fun. Everything is provided on site and no previous shooting experience is necessary (or licenses required) for some shooting fun under the watchful eye of a certified range safety officer. All activity takes place in a controlled environment at the Discovery Shooting Club on Catalina Road (Route 238 rebuilt & paved in 2018) that links Elliston directly to the highway (Route 230). A Google map is provided at the bottom of this page. Photo taking is encouraged and we are family friendly so bring the kids. They enjoy it as much or more than the adults! We have a fine selection of firearms available that span a time period from 1868 to the modern day and offer two options. Option A: Theme Packages - Select one or more of our theme packages listed below. Target shooting experiences are by appointment only and usually can be booked with relatively short notice. Please note only cash can be accepted on site. The .22 is extremely family-friendly and is the perfect introduction to target shooting for those who want to start with something really light. It is also something very easy for smaller kids to handle. Here we offer the Ruger 10/22 semi-auto rifle and the Browning Buckmark pistol that both offer a great experience in a compact package. Here is a great sampler of various handgun types. Fire the classic .38 Special from a revolver as used by police for much of the 20th century. Move on to the 9mm semi-auto pistol that has replaced the revolver with additional firepower. Then try the pistol that armed the Soviets during WWII, the TT-33 in 7.62x25mm. Finally try the modern polymer striker fired (i.e. 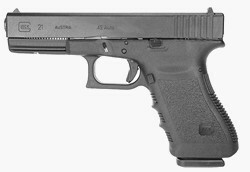 no hammer) pistol – The Glock! 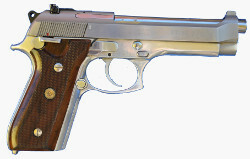 This version is the 21 model that fires the larger diameter .45 ACP round. Fire one of the world’s most recognized military rifles during your visit to Elliston. The AR-15 (also known as the American M16 & M4 or the Canadian C7 & C8) is a great shooter that is quite comfortable to operate. We also provide a SKS rifle firing the legendary 7.62x39mm round as used in the AK-47 Assault Rifle. This version of the SKS has been modified to accept the AK-47 magazines. Here is your opportunity to fire a real black powder antique rifle. The Snider Enfield was the British Army's first general issue breech loading rifle that was adopted in 1866 replacing the 1853 rifled musket. Specifically, we have an 1868 dated example that was built as a musket and converted to a breech loader. In this format it is known as the Snider Mark II** pattern rifle and fires the .577 Snider (black powder) cartridge. The muzzle loading version of this gun was used in the U.S. Civil War primarily by the Confederacy against the North. So, this is a unique opportunity to know what it was like to fire such a rifle. Please note that ammunition for this rifle is very limited and may always not be available. Here is a special opportunity to stand in a replica First World War trench and fire live ammunition over the top from a real WWI rifle. We will even provide a period helmet to make your experience that much more unique as well as being a great photo opportunity! Additionally, you get the thrill of firing an authentic British Officer's personal sidearm - the historic Webley Revolver in the rare .455 caliber! Remember, we have the only replica trench that is certified for live fire. $30.00 extra = Fire a grenade launcher (i.e. a cup attachment secured to a rifle that launches grenades using a blank cartridge). You get to fire 3 non-explosive grenades substitutes downrange. See WWI Arms Demonstration - Rifle Discharger Cup for an overview of this weapons system. For an example of a grenade substitute being fired Click Here. Looking for a truly unique one of a kind experience? If so, here is your chance to experience all the weapon systems seen in the WWI Arms Demonstration Video (below). It depicts First World War interpreters using various weapon systems available in 1917 and was filmed at the Discovery Shooting Club where all shooting takes place. This is our largest and most expensive offering but encompasses everything in the Trench Warfare Experience (WWI) Package and elements of other packages. Additionally, this package includes some items offered nowhere else! Where else are you going to have the opportunity to do something like this? We provide a dummy for you to lob down range as in the video. Do you like Western movies? If so don’t miss out on a chance to fire some of the most well-known Western style guns while being just as far East as you can go in North America geographically! Available is a single action Ruger Vaquero (Spanish for Cowboy) pistol firing the legendary .45 (Long) Colt round. There is nothing quite like launching those big .45 rounds from a pistol almost identical to what we all saw on the silver screen. Every Cowboy needs a rifle and here you also have your opportunity to fire the classic lever action .30-30 that has been so prolific through all of North America. Remember the Terminator and the weapons it used in Terminator 2: Judgment Day? If so you will probably recall the iconic lever action shotgun being used in the film (Click for photo). In this package you will experience the thrill of firing a copy of that memorable shotgun (Unlike Arnold two hands are required!) 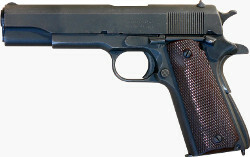 and the 1911 .45 pistol that is so widely used in film and television. Frankly, it’s an experience you will remember for a long time. The Eastern Front during World War II saw the largest military confrontation in history between Germany and the Soviet Union. Here we have one of the best bolt action rifles of all time, the famous K98k Mauser rifle that was the backbone of the Wehrmacht (German army). 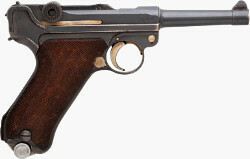 Next is the iconic Luger pistol that needs no introduction. Don’t pass up an opportunity to shoot some real pieces of WWII history. Here we have the best Soviet bolt action rifle of all time the Mosin Nagant. Specifically, we offer a chance to shoot the compact M44 variant in the powerful 7.62x54Rmm cartridge. 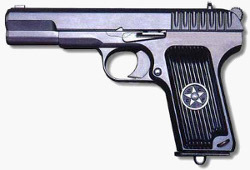 Then try the pistol that armed the Soviets during WWII, the Tokarev TT-33 in 7.62x25mm. Don’t pass up an opportunity to shoot some real pieces of history. All activity takes place at the Discovery Shooting Club. See below for a map. The DSC provides a safe location for shooting activities & is a community partner in the region. Website for the Elliston, Newfoundland. Wholesome Living vacation Home & Flower's Cove Hike and Picnic. The Meems' Elliston B&B. Down to earth, by the ocean. Our lovely old house is located in the stunning little outport of Elliston, on the Bonavista Peninsula. Check it out – the Huffington Post have announced their 5 Best Burgers in Canada and Bonavista Social Club's Ultimate Moose Burger made the cut!